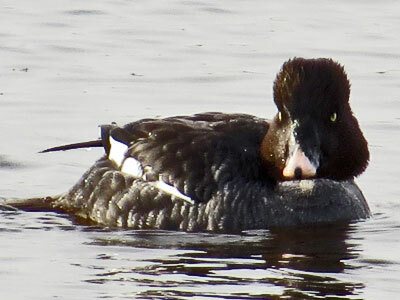 The goldeneye is one of several diving ducks that winter in the Chesapeake Bay watershed. This duck is often observed feeding on small fish and other prey with its smaller relative, the bufflehead. Goldeneyes also associate with hooded mergansers, red-breasted mergansers, surf scoters, long-tailed ducks, and other fish-eating birds. Male buffleheads have a dark green head with prominent white cheek patch. Females have a brown head with cream colored cheek patch.